On device running iOS 9 and later, you can use Universal Links to launch Google Maps when you have a Google Maps URL. You can use the Google Maps URL scheme to launch the Google Maps app for iOS and perform searches, get direction requests, and display map views. When you launch Google Maps your bundle identifier is automatically sent as part of the request. You don't need a Google API key to use the Google Maps URL scheme. Note: Maps URLs let you build a universal, cross-platform URL to launch Google Maps and perform searches, get directions, display map views, and display panoramic images. It is recommended that you use the cross-platform Maps URLs to launch Google Maps, since these universal URLs allow for broader handling of the maps requests no matter which platform the user is on. You should only use the iOS-specific Maps URL Scheme for features that may only be functional on a mobile platform (for example, turn-by-turn navigation). Google Maps for iOS supports Universal Links on devices running iOS 9 or later. If your URL matches the following regular expression, and the device is running iOS 9 or later, you may want to consider using the openURL: method directly. Display a map at a specified location and zoom level. Search for locations or places, and display them on a map. Request directions from one location to another. Directions can be returned for four modes of transportation: driving, walking, bicycling and public transit. Add navigation to your app. Through iOS 8, issue a callback when the app has completed, using comgooglemaps-x-callback://. Callbacks are often used to return a user to the app that originally opened Google Maps for iOS. Note that on iOS 9, the system automatically provides a "Back to" link in left corner of the status bar. comgooglemapsurl:// - This scheme allows you to launch the Google Maps app for iOS using a URL derived from the desktop Google Maps website. This means that you can give your users a native mobile experience rather than simply loading the Google Maps website. The original URL can be for maps.google.com, or for google.com/maps, or using any valid top-level country domain instead of com. You can also pass on goo.gl/maps redirection URLs. You can issue a callback using the x-source and x-success parameters with the comgooglemapsurl:// URL scheme. Note: Beginning with iOS 9, your app must declare the URL schemes that it will open. See Getting Started for more information. Parameters are described in detail later in this document. Use the URL scheme to display the map at a specified zoom level and location. You can also overlay other views on top of your map, or display Street View imagery. All of the following parameters are optional. If no parameters are set, the URL scheme will simply launch the Google Maps app for iOS. center: This is the map viewport center point. Formatted as a comma separated string of latitude,longitude. mapmode: Sets the kind of map shown. Can be set to: standard or streetview. If not specified, the current application settings will be used. views: Turns specific views on/off. Can be set to: satellite, traffic, or transit. Multiple values can be set using a comma-separator. If the parameter is specified with no value, then it will clear all views. zoom: Specifies the zoom level of the map. In addition to the parameters used to display a map, Search supports the q parameter. q: The query string for your search. Use this scheme to request and display directions between two locations. You can also specify the transportation mode. saddr: Sets the starting point for directions searches. This can be a latitude,longitude or a query formatted address. If it is a query string that returns more than one result, the first result will be selected. If the value is left blank, then the user’s current location will be used. daddr: Sets the end point for directions searches. Has the same format and behavior as saddr. directionsmode: Method of transportation. Can be set to: driving, transit, bicycling or walking. If you'd like to specify a callback URL, you must use the comgooglemaps-x-callback:// URL scheme. This scheme adheres to the x-callback-url specification. When you call the Google Maps app for iOS with this scheme, the app will display a button at the top of the screen. Tapping this button will issue a callback to a URL that you've specified. The x-callback URL scheme accepts the same parameters as the comgooglemaps:// URL scheme, with the following additional parameters. Both parameters are required. x-source — The name of the application sending the x-callback request. Short names are preferred. x-success — The URL to call when complete. Often this will be a URL scheme for your own app, allowing users to return to the original application. Note that your app will have to register its own URL scheme so that it can respond to the callback URL. Ensure that your application has registered a URL scheme that can respond to the callback request. Pass the label for the callback button in the x-source parameter. Pass the callback URL in the x-success parameter. 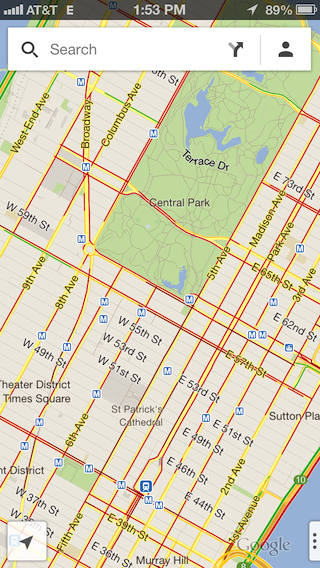 The following example will launch the Google Maps app for iOS and display a map centered on New York. The app will also display a button labelled "SourceApp". When the "SourceApp" button is clicked, the Google Maps app for iOS will issue a callback to a fictitious URL scheme, sourceapp://?resume=true. An example of a URL that lets users return to an app after searching for dessert is shown below. Launching Google Maps app for iOS with a directions request is an easy way to give your users access to turn-by-turn navigation from your app. You can use either the comgooglemaps:// or comgooglemaps-x-callback:// URL schemes. Note: Buttons added via the x-source parameter will not be displayed in the turn-by-turn navigation UI. 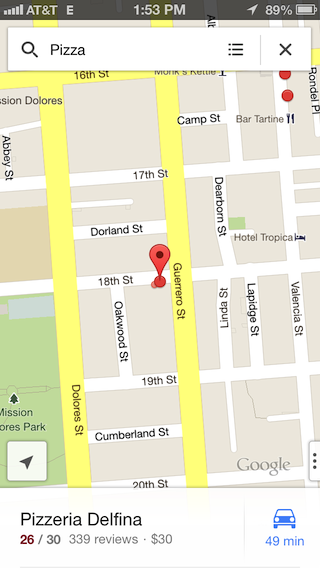 Verify that the comgooglemaps-x-callback:// URL scheme is available. 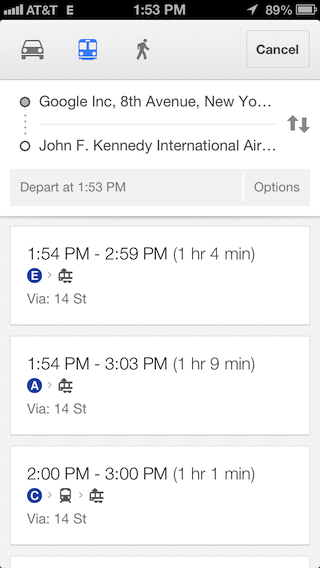 Launch the Google Maps app for iOS, and request directions to JFK Airport in New York city. Leave the start address blank to request directions from the user's current location. Add a button labelled "AirApp" to the Google Maps app for iOS. The button label is defined by the x-source parameter. Call the fictitious URL scheme, sourceapp://, when the users clicks the back button. let testURL = URL(string: "comgooglemaps-x-callback://")! let directionsURL = URL(string: directionsRequest)! If your app has access to a pre-existing Google Maps URL, such as on a web page or in a database, you can use the scheme below to open the URL in the Google Maps app for iOS, thus offering your users the best native experience. Replace the http:// or https:// scheme with comgooglemapsurl://. If you want to use a callback, include the x-source and x-success parameters. This scheme adheres to the x-callback-url specification. The following example will launch the Google Maps app for iOS and display a map with directions to Tokyo Tower, as specified in the original Google Maps URL (above). The app will also display a button labelled "SourceApp". When the "SourceApp" button is clicked, the Google Maps app for iOS will issue a callback to a fictitious URL scheme, sourceapp://?resume=true.